The older our kids get, the more time we spend discussing what their goals are for the future: What GPA do you want to graduate with? What sports team would you like to make? What can you do to be helpful to someone else? With a new year upon us, it a great time to have everyone in your family take just a bit of time to ponder through the previous year and to make some goals for the new year! It would be a great idea to make a night of it. Celebrate the past year and look forward to the new year with a fun family dinner, a few games and a brief time to reflect and goal set! 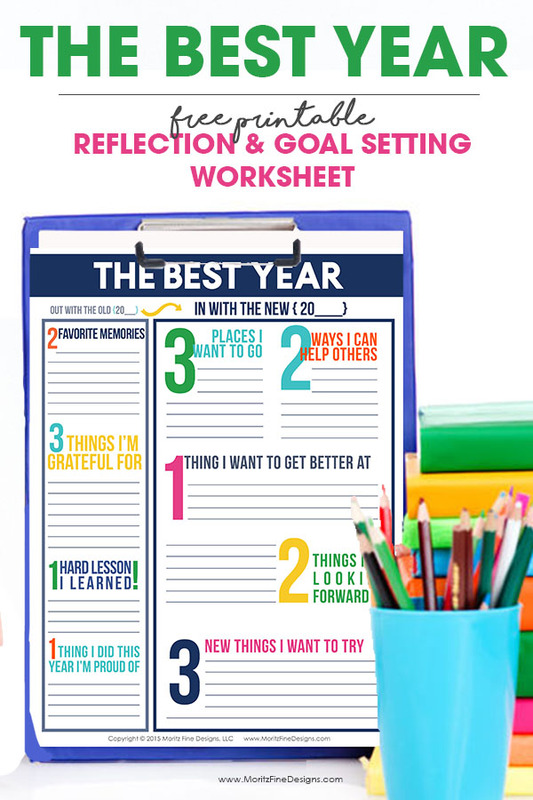 You can use “The Best Year” free goal setting printable! Simply click on the download link at the bottom of the post and print out as many copies as you need. 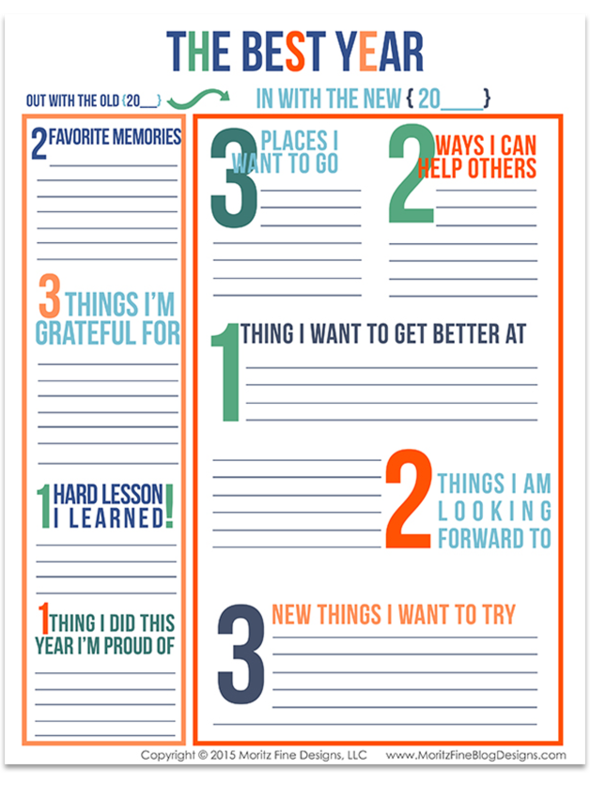 The year is left blank so that you can use this same goal setting printable year after year. How awesome would it be to go back every year and look at the previous year’s goals? 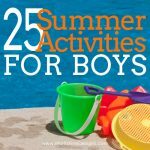 It’s amazing for kids, especially, to see what they have done over the past year–their accomplishments, tasks done and growth! Choose from two great style options below, both will come in your download! Get all of my printing tips here. Enjoy your time processing, thinking and analyzing! Once you write your new goals down, be sure to place your Worksheet in a place that you can view it as a reminder! Want to be more detailed in your goal setting? Check out this Yearly Resolutions Printable, where you can set both yearly and monthly goals! The best year goal setting printable is just what I needed, thanks! Thanks for this printable! I’m spending the afternoon today, before school starts back up, doing this with my kiddos! Looking forward to the reflection and the fun opportunity to write! Hope the kids enjoyed them…even if they don’t enjoy them now, they’ll love looking back at them in 20 years! I saw this on youtuber CreativePlanner’s video from Jan 2015. In case you didn’t know. Love this as something to do over the holidays. Never too early to prep for new year’s goals. I agree! We have our entire family do this every year! I LOVE THIS! I’m going to print off one for each of our kids AND one for my husband and I to fill out and we will all compare/read our answers. 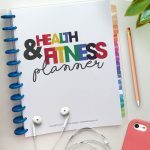 This is such a fun way to look back on the year and make fun yet attainable goals for the year ahead! Thank you for this New Year printable! It is exactly what I was looking for. We will be filling these out tonight. Have a great New Year! Thank you for this printable! Perfect for a goal setting for my kids. Have a great 2016! Hey thank you for making this! This printable is awesome! It was a hit for my classroom! Used this with my family last night. It was perfect! Thank you so much for sharing your talent!! Awesome…it’s fun to take it out a year from now and see what goals were accomplished! This is fantastic! 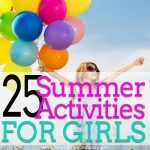 Thank you so much for making and sharing this <3 I am going to use this for a church activity with 8-12 year old girls. Awesome! Glad you can use it, and thanks for stopping by the blog! My husband and I just read our 2015 to each other and filled out new ones from 2016. Can’t wait to continue this tradition. Thanks for helping us reflect! That’s so awesome, Heather!! Thanks for sharing with me! 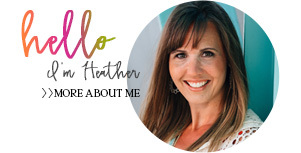 Heather, Thank you so much for this great post. I am a life coach. I shared on my blog(http://www.rklifecoach.com/how-do-you-plan-family-goals/), information from several sources about making family goals and having a family meeting. I shared a link to your post and some of the information I most appreciated from it. I love the ideas for reflecting what you want to change this year, including “what I am proud of” and “things I want to try.” I also used these ideas when making goals with my family. AWESOME! Thanks so much for sharing, Rebekah!! I’m going to hop over to your site to check it out. I love this printable! I was wondering if I could use this in a blog post I’m writing for my church on ways to look back and look ahead? I know that it is copyrighted, so I don’t know what the rules are with using it somewhere else. Thank you! Thanks for asking, Karissa! 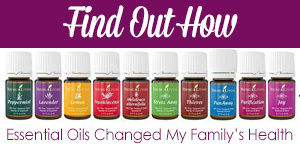 I emailed you details with how to share it! I just tried to download this but it keeps giving me an error for drop box. Is there another way to download it? Could you just email it to me? I also tried to download with no luck. Any chance you can send? Thanks! Hi I also wasn’t able to download, it asked me to join your mailing list, which I did, but still no luck. It’s a great sheet would love to use it with my kids! Thanks! Sent you an email, Jessica. Hi! I’d love to print this for tonight but cannot figure out how to download ! Can you please email to me? Trying to download. Anyway you can send? I tried to download this but it doesn’t seem to work. Would you mind sending to me, too, please? I cannot get this to download. I have completed all the information but it just hangs there at 50%. These are so cute! I printed them for our youth group of girls to fill out. Thank you! Submitted the form but did not receive anything. Can you please send it? For some reason, I can not download the best year printable. Can you send it to me? I am unable to download? Can you email? This is beautiful! Hello we would like to download this for our children. Can you please email ? I’m having trouble downloading as well! Hello! Every time I try to download the file , nothing happens. Can you please send it? Sent you a link for download! I’ve been trying to download this cute printable but it isn’t emailing to me or downloading. Can you help? Sent you an email, Karen! It looks like it made it through on my end, if that’s not the case, let me know! HI. Not seeing the link for download. Can you please send it? The link is the Pink button at the bottom of the post! Hi I’ve tried several times to download the file unsuccessfully. Can you please email the file? Love using these with our family. Best wishes! Sent you an email, Shauna! Thank you so much! I got it! Best to you for 2019! I love this! I love the reflection part of it too! Thank you so much! I’ve tried several times and also can’t get the printable. Just sent you an email, Lindsey! Hi -I am trying to download your printable and have submitted my email address but it won’t let me download. Could you please send it to me? Thanks! The download comes via email! You just have to give it a few min. to arrive in your inbox! Happy New Year! Hi! It is getting stuck at 50% for me as well. Would you be able to send an email to me? Thank you in advance, this looks perfect for my student! It looks like it got delivered to your inbox—if that’s not the case, let me know and I can email it to you! Hi! I tried to download as well but no luck. Could you send me an email? I see it was sent to you at 8:15! Check your inbox and your spam. If you still don’t see it, let me know! SURE! Just sent your way. Will you email it to me, too? The download bar only loads to 50% for me. Thanks! We’ve been doing these as a family since 2016 and it’s so fun to look back on! Isn’t it, though? Just sent! Hi please send me the link, I cant download. Many thanks. Could I please have a link to print the goal sheet? I am not able to do it from your website. Looks like it arrived in your inbox! Hi! Could you email this to me! I would love to use it for my youth group tomorrow! Would love to use this as well- could you email me the link- it is not downloading? Just sent! Remember to check your spam if you don’t see it in your inbox! Could you please send it to me as well? It is still at 50% for me as well. It got sent to you yesterday! Remember to check your spam if you don’t see it in your inbox! Hi There! Have tried downloading this several times, but it is not appearing in my inbox. We do this every year and would love to continue the tradition! Hi – Would love a copy of this too! 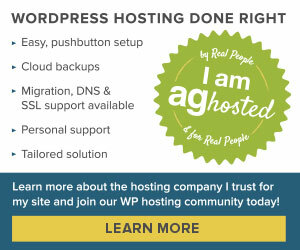 It’s stuck at 50% for hours on your website. Sent you an email, Holly! Hi, I too am stuck at 50%. Could you please send a copy to me? 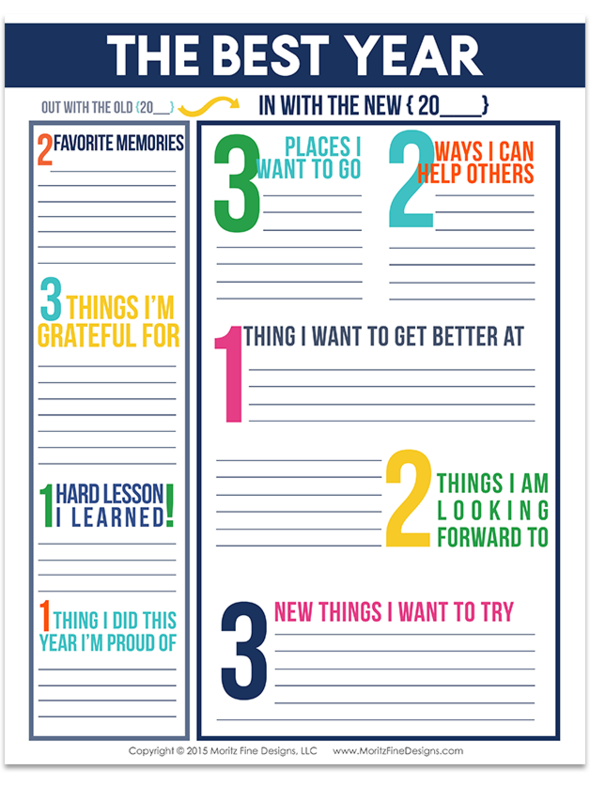 Could you send me a copy of the goal setting sheet for the new year? Mine seems to be stuck on 50% and I can’t get it to finish. Thank you.